Having electrical issues in your home? In our experience with customers, there are often simple troubleshooting steps you as the “do-it-yourselfer” can take yourself to solve common household problems. Save yourself a little money and inconvenience–check out these do-it-yourself electrical tips for homeowners and try the troubleshooting steps before you call an electrician. 1. Call the electric company. If you suddenly find half your house dark, multiple large appliance stop working or lights are flickering throughout the house, there are a multitude of potential problems which could be causing such issues. I always tell my customers to call their utility company first (here in Florida, Duke Energy) to have them check their wiring first before you have an electrician come out. Very often the electric company has issues with their wiring that affects your home. Call them first. It’s free for them to come out and it could save you from having to pay an electrician for this same advice. 2. Check the panel for a tripped breaker. I know this may seem obvious, but bare with me. If an outlet or light isn’t working, not everyone thinks to check the panel for a tripped breaker. Sometimes the customer hasn’t noticed that the breaker is in the tripped position and maybe just doesn’t know what to look for. An easy way to ensure all the breakers are in the on position is to turn every breaker in the panel ALL THE WAY OFF, then ALL THE WAY ON. There should be a definite clicking sound, turning from ON to OFF, if the breaker is working correctly. 3. Look for the obvious, or not so obvious. When a breaker is tripping in a certain area take a quick survey of the areas that are not working. Look for burned extension cords, frayed/chewed lamp wires or appliances that might be defective. Unplug anything in the area that is defective or non-working in some way. 4. It’s definitely not the bulb? Check again. I can’t tell you how many times I’ve been called out to fix a light that isn’t working and I’m told it’s “definitely not the bulb because its brand new.” Double check that your bulbs are working on a table lamp or other light fixture that you know to be working. Sometimes multiple “new” bulbs in the same package don’t work, so it doesn’t hurt to double check. 5. Hit the reset button. Let’s say your kitchen and bathroom outlets suddenly stop working. 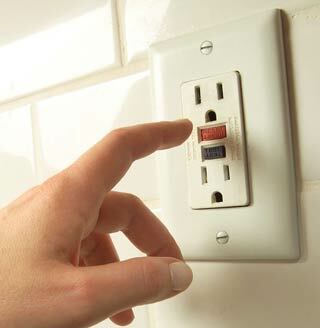 Most bathrooms, kitchens, garages and outside outlets have special GFCI outlets. These are rectangular and will have “test” and “reset” buttons at the center of the outlet. These outlets are designed to protect against shock, especially in wet locations. They can operate alone or protect other outlets on the same counter top, in the case of a kitchen, but can also protect an outlet on the complete opposite side of the house. If outlets suddenly stop working, go through your house and press “reset” on any GFCI you find, and very often your non-working outlets will turn back on. If these DIY electrical troubleshooting steps don’t solve the problem, chances are you probably have a more complicated problem at hand. But at least you know this, and you can call a company (or call us!) with a little more confidence. Want More Electrical Tips for Homeowners? If you still are having electrical issues or you feel uncomfortable in dealing with any electrical wiring, not to worry! Give Gulfstar a call. We provide 24-hour, fast, efficient and courteous service and look forward to serving you. Call us at 727-755-1805!